The last fragrance (alphabetically) in the Incense series by Comme des Garçons is Zagorsk. If you are not familiar with this series, see Monday's review of Avignon & Jaisalmer and yesterday's review of Kyoto & Ouarzazate for an introduction. Zagorsk was the Soviet-era name for the town of Sergiyev Posad. 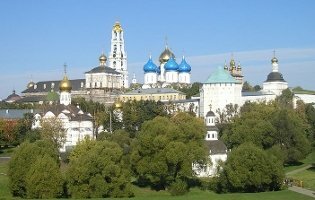 The town, which is not far from Moscow, is home to the Holy Trinity Monastery of St. Sergius, often called the spiritual center of the Russian Orthodox Church. The symbolism of incense in the liturgy is essentially the same as it is in the Catholic Church: it represents purification, an offering, and the rising of prayers to heaven. The notes for Zagorsk are white pine incense, violet, pimento berry, iris, hinoki wood, cedar and birch. The top notes are a sharp burst of pine balsam, but that is short lived, and as it settles it is joined by prominent notes of cedar and birch. The smoke is subdued at the start and fades away to barely a whisper as it warms on the skin; the wood notes are meanwhile softened by a velvety iris and a very light touch of floral sweetness from the violet. The end result is an understated, rather sober wood fragrance. It is too placid and restrained to captivate me entirely. Ouarzazate has a more muted presence, but worn next to Zagorsk, it has a more lively aspect, perhaps because its transparency allows the smoky resinous notes to shine through more clearly. Likewise I find the earthiness of Kyoto more meditative than the chilly sobriety of Zagorsk. But all of that is to split hairs, it is a lovely scent in its own right and suffers here only in comparison to the others. As I said before, Incense is easily my favorite of the Comme des Garçons series. There is not a dud in the bunch, and even my least favorite, Jaisalmer (see below), is a fragrance that I would happily wear if a bottle was to fall from the skies. At $54 for 50 ml, the fragrances are also a bargain, especially when you compare to other niche scents of similar quality. I had it in mind to close with a list of the fragrances in order of my own preference. That was harder to do than I thought. I changed the order of the first three at least twice while writing this, so take with a grain of salt, but: Avignon, Ouarzazate, Kyoto, Zagorsk, and then Jaisalmer. 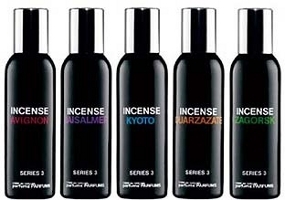 Update: Times and prices change, but even in 2009 the Incense series fragrances are a bargain at $80 each. Zagorsk was developed by perfumer Evelyne Boulanger. Note: image is Russia-Sergiev Posad-Troitse-Sergiyeva Lavra-Panorama-5 by Alex Zelenko via Wikimedia Commons. So M, what does the smell remind you of, exactly? Is it the incense actually used in the Church, or just the area around the city, or ???? I like Zagorsk, but I find the iris in it rather synthetic and it bothers me. The old Orthodox churches were built out of wood, pine to be specific, therefore this is what the nose used here. Orthodox incense is a combination of frankincense and myrrh, but it is sweeter to my nose than the more resinous Catholic incense. Thanks V, I assumed the incense would be about the same. First of all, just wanted to say that I love this blog and I read it every day. Thanks! I think the unique aspect of Zagorsk for me is that it is infused with a wintry outdoors. That makes it more lively for me than the others, which are all fine scents in their own right. R, I´ve a sample of Zagorsk & while I like it, it´s again something I don´t think I´d wear very often. In the last months I´ve become even more picky when it comes to fragrances than I already was before. I always need several weeks before I buy a fragrance, testing it every other day & even then I´m not sure if I didn´t make a mistake. Robin, thanks again for doing the series. I have been wondering about these for quite some time, and it gives me a sense of where to start. Of course, if they offered them in a handy COFFRET…. I'd have them all! S, the bigger my collection gets, the more it takes to move me to buy, so I quite understand! M, will be curious to hear which, if any, you love from this set. I enjoy the meditative feeling of this, but I would like it better if it developed on me the way that you describe. On me, the “sharp burst of pine balsam” is anything but “short lived”! In fact, it seems to become sharper and stronger as it continues, creating something of a a 'Pine-Sol” accord (or perhaps I simply become more annoyed with it, and this is why it seems stronger). It doesn't ruin the fragrance for me, but it prevents me from liking it as much as some others. My order (taking into account that I haven't yet retried Ouarzazate, so may upgrade:): Kyoto, Avignon, Ouarzazate, Zagorsk, Jaisalmer. J, the pine lasts on me but not the sharpness, although I do know what you mean by the Pine Sol. Overall our preferences are not terribly different — had a hard time picking between Kyoto & Avignon for top place, although at other times I would put Ouarzazate first. Not very decisive here, I'm afraid! I confess, I haven't smelled any but Zagorsk because it's just so perfect for me. I don't get any developement though. Just cedar and “snowy air”. But that is simply wonderful for me and makes me feel so happy! Also, it's the only fragrance that is supposed to evoke thoughts of cold and snow that actually does IMO. A, it is so interesting how differently people perceive Zagorsk. Agree completely that it evokes thoughts of cold and snow, and nothing that does that can make me happy, LOL! Oh, please don't apologize — I went quite willingly. Darling little decants should be arriving by nearly every post. I am trying quite a few with violet, am curious to see if any will layer well with this, or others in the incense series. Maybe I should just leave that fugitive suggestion of violet alone… Thanks so much for broadening my horizons, I shall be checking in frequently! Violette layered with Zagorsk would be lovely. Annick Goutal La Violette, maybe, if you can find it? But I'm also partial to the very simple Borsari Violetta di Parma. Hello. Thanks for this wonderful blog. I really enjoyed reading this. If you do not mind I would like to leave a comment regarding the perfume. Please note that all the below mentioned is my humble opinion only. To comprehend this perfume completely you should be Russian or make several visits to Russia at least. As for me Zagorsk is my leader in the Incense Series of KDG. Top notes are a chord of pine (or fir) needles and resin, shrill but becoming softer with time. Then incense and birch bark appear sweetened with soft aroma of iris. In general Zagorsk is cold transparent aroma of birch wood saturated with melted snow with strong incense base. This is how it smells in Russian coniferous and birch forests early in spring. The perfume is introvertive making me absorbed in my thoughts. Meditative. Triumph of spirit over the substance, I would say. To describe it in a word it is VERY RUSSIAN. That seems to be the consensus of the Russian perfumer bloggers I know, thanks for commenting!